I met Kim in September or so of 2008 for a May wedding. I love it when brides come to me early! It provides a little more time for the creativity process. 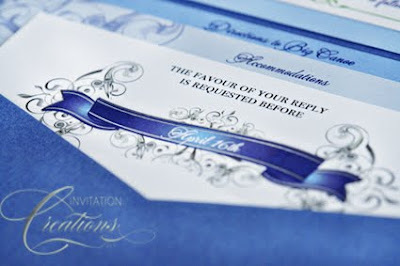 Typically I ask for 3 weeks to design a client's invitations but when we have additional time I like to take an extra week or so and more times than not, I end up with a result I am happy with and so is the client! Kim was getting married in a beautiful venue and it would be outdoors but she didn't like flowers and really didn't care for an outdoor look. 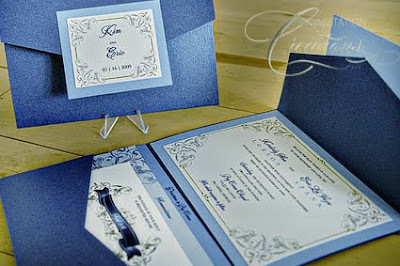 She described the venue as rustic so she wanted a more classic take on the invitations. She seemed to gravitate towards the swirl designs in my portfolio. The only thing she did NOT want was the text center aligned. So, after searching for graphics that I thought would compliment her style and her vision, I found several I thought she would like. One design, even though she had requested no text down the middle would have exactly that. But I thought she would love the design so I risked making this one in hopes that she would like it despite that one little fact. The other samples had text as she had requested. I create 4 samples total. 2 swirl designs, 1 rustic design and 1 swirl with text down the middle. Come sample review time, she, her mother and her fiance came to view my creations. they were thoroughly impressed with all of them! 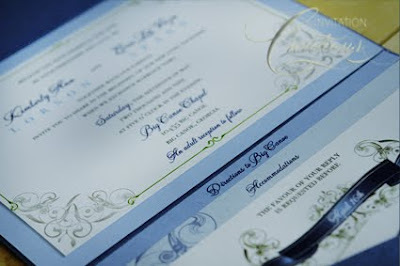 I love to see client's expression when they see what I have created for them! It makes all the hard work worth it! 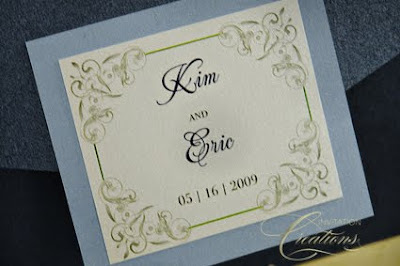 Her mother loved them all, her fiance liked the rustic one and Kim liked the swirl design with the text down the middle! I have done this many times, create a sample that wasn't requested, but thought the client would like, so I take the time to create it and I would say 9 times out of 10 they choose it. One of my favorite features was the graphic on the response card. It was the graphic with a banner on top which in this case had the response cutoff date.